1. I never see people like soccer moms or teachers in the line. Kids tend to drain both time and money from parents, teachers, and others who deal with children. 2. 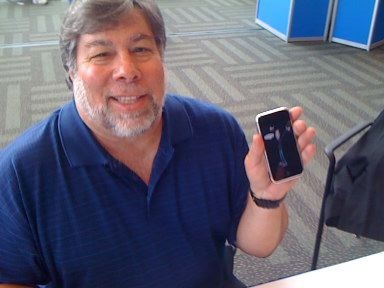 Steve Wozniak – Steve Jobs partner in the early days of Apple does show up in line. Of course, if my ID badges said “Apple Employee #1” and I had the Apple iStock, etc. that he probably does, and if I knew my presence would get the new product featured prominently on the morning, noon, evening and eleven o’clock news – you can bet I’d be in line – and available for an interview! Did you realize that a metaphor can be like a simile? Also, you can use a metaphor as a simile. No one on their death bed regrets splitting infinitives. As a writer, even at my age, I actually still do – on occasion – diagram sentences. The reason that we were given so many story problems (also known as thought problems) in math when we were young was for a very good reason. So we could help our kids with their homework. This entry was posted in Business, Humor, Technology. Bookmark the permalink. tho please do not tell him i said that!! c and ps, he does not have one of those iphone thingies! they are too complicated he says! !